The purpose of this study was to evaluate the N-glycosylation profile of the product and antibody reference standard formulation. The N-glycan profile of antibody was evaluated by releasing N-glycans from the product molecule utilizing digestion with PNGase. The released N-glycans were separated and enhanced using solid phase extraction, and 2-AB labeling. The labeled N-glycans were then separated by HILIC chromatography and identified using fluorescence spectroscopy. N-glycan standards were employed to assess the presence of the N-linked oligosaccharides in antibody formulation. 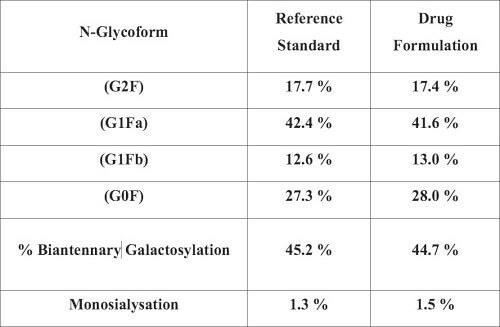 The fucosylated N-glycan having a terminal galactose was major N-glycan body in both the product and reference standard formulations with nearly 50 to 55% of the total N-glycans noticed. The fucosylated N-glycan having two terminal units of galactose was seen at nearly 14 to 18% and N-glycan without galactosylation was also noticed at approximately 27 to 31% in both the formulations. Low concentrations of sialylated glycans were identified but no significant concentrations of N-linked oligosaccharides and Man5 without a fucose body were seen in the test compounds. The N-glycan profile of antibody formulation was similar to the reference. All N-glycans detected in both antibody products were fucosylated N-linked oligosaccharides, having one terminal galactose as major portion. N-glycan having two terminal galactose units and an N-glycan with no galactosylation were also detected in these formulations. This study explains the method for estimating the glycan profile of a monoclonal antibody and a reference standard lot from a drug product. 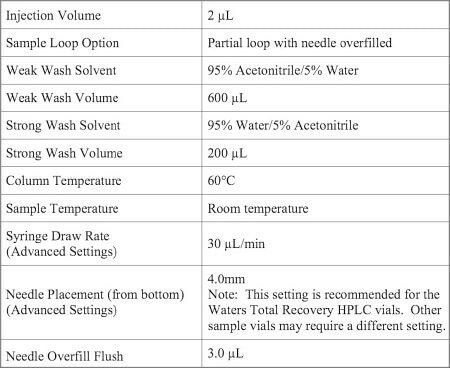 The procedure includes labeling with 2-Aminobenzamide (2-AB) and assessment on UPLC-HILIC with fluorescence detector. The intended utilization of this method is to give analytical support to clinical development of drugs. The purpose of this study was to estimate the N-glycosylation profile of an antibody reference and product composition. Genetically-expressed recombinant therapeutic monoclonal antibodies were the key materials employed in this project. The antibody was in highly refined form in the drug substance and the product. The key equipment utilized in this study was a Waters Acquity Binary UPLC combined with a Fluorescence detector. 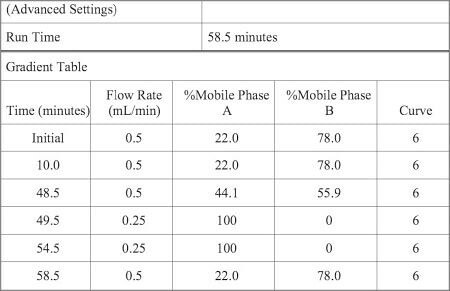 N-glycan release from antibody was performed using denaturing of the molecule for 10 minutes at 65 °C temperature and incubation with PNGase F in pH 8.0, 50 mM Tris-HCl for a minimum of 16 h at 37 °C. The sample of released N-glycan was loaded to a pre-conditioned SPE cartridge and cleansed multiple times with acetonitrile employing a vacuum manifold. Aqueous solvent was used to elute the bound N-glycan off the cartridge; it was then dried in a vacuum evaporator (Speed VAC concentrator). The 2-AB labeling solution was added, mixed with the sample, and incubated at 65 °C for 3 h. Acetonitrile and ammonium acetate solutions were added and centrifuged. The supernatant fluid was taken to a HPLC vial for evaluation. 100 µL Acetonitrile and 100 µL of pH 4.5, 100 mM Ammonium Formate were added to the vial of Performance Standard. Small aliquots of the standard were frozen at – 20 C until evaluation. Note: Compute the %Peak Control for G0F, G1Fa, GlFb, G2F and GlF + SA, and G2F + SA, respectively. Evaluation of N-glycan profile of a therapeutic formulation of monoclonal antibody was obtained from N-glycans separated from the antibody after N-glycanase breakdown. The digest part was loaded to a solid phase extraction column to bind hydrophilic oligosaccharides and cleansed off the hydrophobic proteinaceous portion with organic solvent. Bound glucosamine sugars were washed off the column with aqueous solvent and further labeled with fluorescent 2-AB. 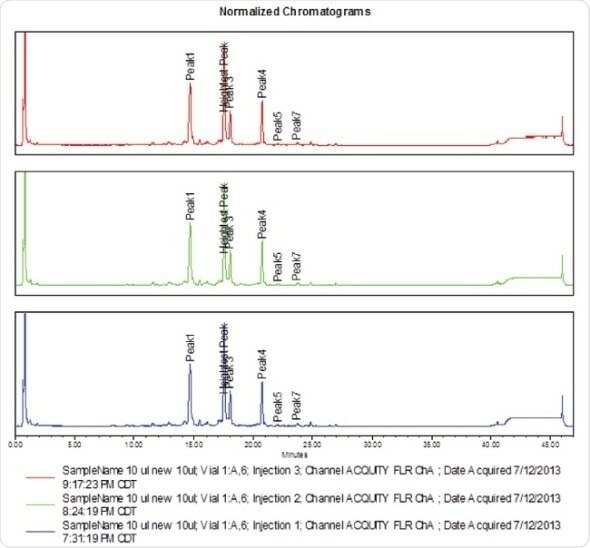 Several forms of N-glycans mainly observed in immunoglobulins were separated by HILIC chromatography and identified by Fluorescence spectroscopy (Figure 1). Standard samples of Immunoglobulin N-glycan were parallel labeled and assessed with the samples to recognize the N-linked oligosaccharides in antibody products. The HILIC-fluorescence assessment gave good precision and linearity and for N-glycan measurement in monoclonal antibodies (Figure 2). 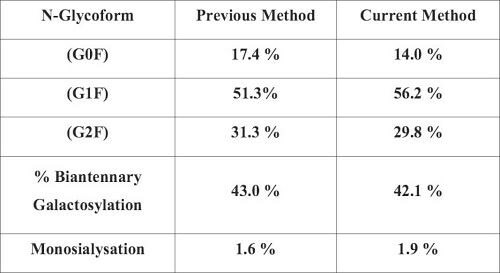 Similarly, injection reproducibility was also shown (Figure 3) in this procedure. 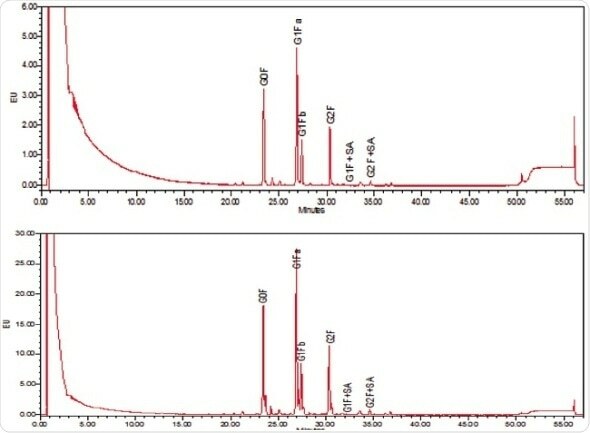 Similar chromatographic profiles were seen for N-glycans between the new drug product and reference standard (Figure 4). As depicted in Table I, similar compositions of N-glycan were seen with current HILIC method comparable with previous method using ion-exchange chromatography by another laboratory. 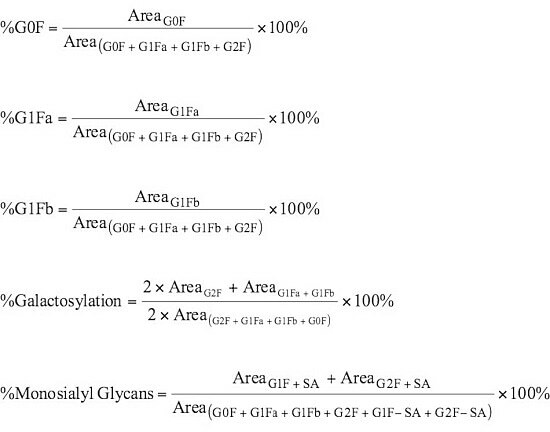 In Table II, N-glycan with one terminal galactosylation and fucosylation (G1Fa, b) was the main N-glycan body in both the product and the reference standard formulations at nearly 50 to 55% of total N-glycans noted. 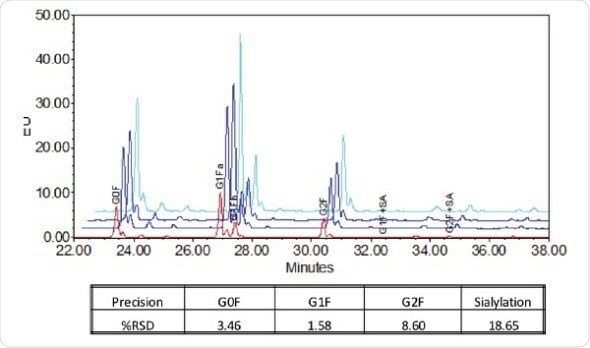 Fucosylated N-glycan with both terminal galactosylation (G2F) was seen at approximately 14 to 18% and N-glycan with no galactosylation (G0F) was seen at around 27 to 31% in both product and antibody reference standard formulations. Other types of N-glycans like monosialylated glucosamines were identified at low concentrations at below 2%. Unfucosylated N-linked oligosaccharides and Man5 were not identified in test materials. Figure 1. 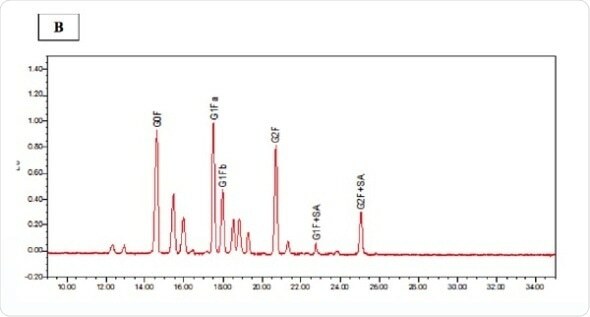 Representative chromatogram of the expected (A) and observed (B) N-glycan standard profile by HILIC-fluorescence detection. Figure 2. Linearity and precision assessment of the N-glycan profiling by HILIC-fluorescence spectroscopy. Figure 3. Injection repeatability of the N-glycan profile of a therapeutic monoclonal antibody. Figure 4. HILIC chromatograms of N-glycoforms in the reference standard and antibody drug formulation. Antibody N-glycan profiling was done using PNGase F digestion, 2-AB labeling, separation by HILIC chromatography and detection using Fluorescence. All in all, the N-glycan profile of antibody formulation was similar to the reference product. All N-glycans seen in both antibody compositions were fucosylated N-linked oligosaccharides having single galactosylation as major glycoform body. The N-glycan having both terminal galactosylation and N-glycan with no galactosylation were also seen in these antibody products for therapeutic use.